Steve Reich - Drumming. Vinyl LP, CD. Bleep. Steve Reich’s Drumming can legitimately claim to be one of the most influential pieces of music to be composed in the last half-century. 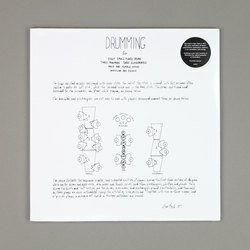 Penned in either 1970 or 1971, Drumming represents the first triumph of Reich’s attempts to synthesise his 1960s experiments in phasing with a newfound interest in rhythm. While the best-known recording of Drumming is a Deutsche Grammophon release from 1974, Superior Viaduct have managed to get their hands on a tape of one of the original performances of the piece. Captured in New York City in 1971 and featuring Reich himself alongside several other musicians, this run-through hums with the energy of a truly innovative work bursting onto the world stage.